By being a translator, you provide with an exceptional service by acting as a medium between two languages. They act as a connection between two cultures, two languages, and two people. Therefore, a person trying to pursue this career needs to have strong knowledge in multiple languages, culture, as well as good interpretation and interpersonal skills to go hand in hand with others skills. Though this job is quite an exciting one to go for, it has its own set or advantages and disadvantages to accompany with. Some of the most important ones are mentioned in this context. Translation as a job is very ancient and it is still prevalent in a very large scale because of its importance. Many times translators have played a major role in changing the course of history because of which we are living in a safer world. One thing that you need not worry about when you become a translator under a company is money. Nowadays companies pay handsome salaries to all the people who act as a medium to decipher different languages and help in communication with people from other culture or language. These translators have wide experiences in handling clients from foreign that helps a great deal while getting proposals for their project. No doubt, if the project gets accepted, a translator receives handsome perks and rewards for his services. Even for a freelance translator, helping in communication gives huge rewards and payments. Depending on the relevance of the document, a translator can either earn a petty amount or a very high price. If a formal document has a long deadline then the translator will not be earning a high amount. But if the documents need an urgent compilation then a translator can charge a high amount. Also in certain documents like medical or legal papers a translator can charge pretty high amount. Translators hired by the companies get the scope of growth and receive promotions faster than any other post. If the company is strong and requires communication with a wide variety of culture and want a strong relationship between them, then those companies make sure they hire top-notch communicators for their work. And look after their well-being while providing them with promotions as rewards. Recently more and more companies are tying up with foreign investors for their growth in the market. Thus, the requirement of a translator is very vital for luring clients to invest in their companies. This causes more demand for translator post in the companies and requirement of lots of translators skilled in multiple languages. At the same time, talented ones get a job right away without any hassle due to the high demand of this post. Also, generally every company nowadays hire translators for their company work. a translator is wide communication. You get to know about different people their languages their culture their local words as well as their idioms and common phrases, which is not only of greater benefit but also immensely exciting. You get the opportunity to learn and grow at your own pace, know things that only fewer people know and get one step ahead of other people in linguistic knowledge. 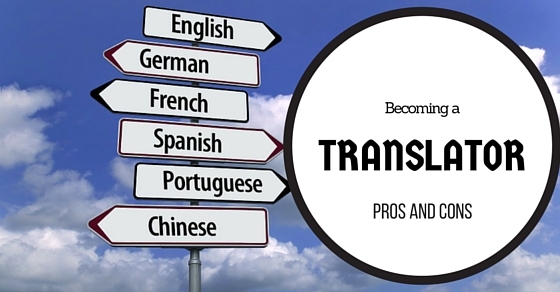 By becoming a translator, you are keeping yourself a step ahead of everyone else in getting to know something different and new. Every language has its own origin and own culture. Getting to know about them is an equally thrilling task. There are thousands of such languages and cultures. By becoming an interpreter, you let yourself into the jaws of new language and acquire knowledge about them which very rare people possess. By being a translator, you become one among very precious knowledgeable personnel. Yes, the biggest benefit of becoming a translator is that you act as a bridge between two entities belonging to totally different language and background yet want to have a connection for various purposes- be it commercial or just for simple communication. As for instance, it is difficult for a Spanish person to communicate in Hindi if they don’t have any common language between them. Therefore, the translator is required to link them together for better communication and understanding. As a translator employee, you will not only act as a link between people but also convert text documents and important paper works into the native language for company understanding. For that, extensive knowledge in writing skills of the particular language is necessary. This task opens up translators from simple communications to a wide variety of tasks that requires translation. One of the benefits, which are unique to this job, is the freedom of working in flexible hours. You can work at your own pace and comfort. All that matters is to complete your job before deadline. Although, in a company atmosphere you will have to present a more organized behaviour but it still gives you the freedom of taking your own time and working as you please. You can learn and become proficient in more than two languages. More language means you can now translate more documents than your colleague which means you can earn more than other people. Not only that as a plus point, you can expand your learning experience and can get a chance to explore more about the culture and history. A work of a translator is not at all easy. You need to have a vast knowledge base about two or more languages with precise translation in context to the document that you will be translating, Such a person can also be enacted to work at different position as managers, interpreters, and in many jobs that are critical or are of international importance because of their high level of intelligence and ability to understand different languages very efficiently. Many of the jobs do not offer such a flexibility to choose between working as a freelancer or as an employee. Working in a company can be fulfilling for some as you can get a constant support of other members to stay motivated. But if you are one of those people who prefer to enjoy their freedom then you can choose the lifestyle of a freelancer. As a freelancer, you are free to work at your own comfort and complete your task at your own convenience. Also, you can work at any moment of your time without the formalities of a company enjoying the facilities of your house while working. Every coin has two sides. The job of a translator is very exciting but it comes with its own set of cons which you should consider before making any choice on choosing your career as a translator. Work of a translator is not at all easy. You need to have a precise detail about languages. Also, you need to know which word would translate to which word depending on the context and matter of topic in the document. This makes it a very daunting task as a wrong interpretation from your part can cost millions and millions of amount to the parties concerned. Even you can lose your job because of few minute mistakes. The field is promising in terms of high income and chance to explore the foreign territory. No doubt this causes a large pool of students to pursue the line of becoming a translator. This leads to a very high steep rise in competition to grab a seat in a company for this job. Also, many institutes nowadays is taking only a few students for the study of translation. This makes it very difficult for many people to get into the desired institute. Work of a translator can be very irregular. At times, you will be sitting ideally making paper aeroplanes (obviously in a figurative sense) and at other times you will be just working non-stop 24*7. This obviously depends on the number of projects that you or your company gets with time. It also depends on the amount of work that both the parties and the clients give you to translate. But all said, this job is not as regular as one might expect it to be. It may happen that your work may make you feel lonely. For most of the time, your work is mostly related to working alone, handling big document and thinking in alone conceptualizing on choosing correct words for translation. As a result, you may sometimes feel as if you are disconnected from the world. You may be a type of person who prefers lonely time and is working as a freelancer but even then you can sometimes feel isolated from the world as you never get to interact with anyone. In case you are working in a company then chances are that you may be getting a continuous flow of projects but even then there is no surety that you will be getting a continuous income. Sometimes, you may be paid immediately, or within 2-3 days, or at an interval of a month, or in some cases after 6 months of completion of the work. In a case of freelancing you are at the head of your financial condition. This makes it very worsening situation as it may become hard for you to sustain yourself. With the rise in the popularity of translating jobs, many self-proclaimed experts and low-level translators started to step up into this world. This caused in the degradation of the quality of expert translator. This has made it a difficult situation not only for companies but also for expert and genuine translators. Companies have lost millions and millions of money because of these spammers and translators are getting fewer projects due to such unqualified translators. Handling personal andprofessional life can be very difficult for the freelancing family woman. Meeting the stringent deadlines along with managing the regular duties of household and spending time with your family can be very demanding for many women. This situation tends to strain the woman to the extent that she becomes unable to perform her duties to an optimum level on both the fronts. In certain cases, where the party needs to have an immediate translation of a document which is not only critical for the company but is also lengthy can increase the workload and stress level of the translator. In those cases’ translator has to use all his knowledge and experience to a very good use. If anything goes wrong then it might cause the translator to lose his job and in some cases’ life threatening situation (feels more like it happens only in movies but that’s the truth). Translators have a long history in the world of jobs and human-kind. They play a very important role of connecting different communities and making things possible between them. But it comes at the cost of extensive knowledge gathering and risk of accidentally misinterpreting certain conversations that lead to a great confusion. Therefore, you should consider your capabilities with the skills that this field demands from you. The field of translation is full of adventures and new challenges and those who successfully get its essence enjoy a life of a king.